Sure Vanguard has some great funds with lowest expense ratio that you could find in the mutual fund industry. However, to invest with Vanguard, you would have to have a deeper pocket because most of its funds have a minimum requirement of $3,000, which essentially prevents investors with small amount of money to start investing to do business with them. If I want to save and invest for my retirement now but have no money to set up an account and can only contribute $50 or $100 a month, what else could be my choices? I had this problem a couple of years ago when I was trying to find a fund in natural resource category with an emphasis on energy. The Vanguard fund in category Vanguard Energy (VGENX) requires a minimum investment of $2,500. During my research, I also considered Icon Energy Fund (ICENX), but eventually chose T. Rowe Price New Era Fund (PRNEX) because it has an expense ratio of 0.66% as compared to ICENX’s 1.17%. Most importantly, with PRNEX, I didn’t have to make any initial investment. I invest in PRNEX through T. Rowe Price’s Automatic Asset Builder (AAB), which is basically a systematic purchase plan. With AAB, the initial requirement of $2,500 was waived after I agreed to buy $50 of the fund every month. Since December 2004 when I started investing in PRNEX, the fund has performed quite well, thanks to the rise of oil price. As of today, the average cost of my investment is $2,320 and the market value is $2,932, at return of 26%. At the beginning, I put $100 into the fund every month, but reduced to $50 later last year. What I like about this automatic investment idea is that it lets me start investing even when I have only a small amount of money. Instead of having to save $3,000 or $2,000 to come up with the initial fund, I can start with as little as $50 a month (and the waiting could be costly over the long term). The best way to invest is to start right away. It’s never too late to start investing. In fact, a $50 monthly contribution could make a huge difference 20 or 30 years later. Assuming a moderate annual return of 8%, the following chart shows what I will have 10, 20, 30, and 40 years later when investing $50 and $100 a month. 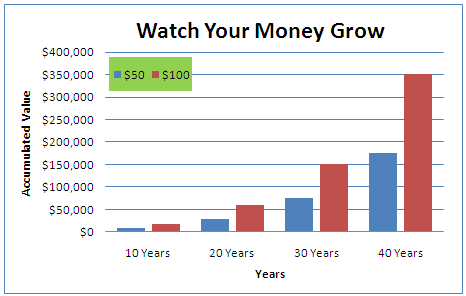 That’s right, I will have more than $350,000 40 years later if I invest $100 every month in stocks from now. Considering the historical return of US stocks is actually 10.4% since 1926, the number could be more impressive. Is there a $10 annual fee until you reach $2500? I am a beginning investor and love TRP’s Auto Asset Builder. You can even deposit every other month, every three months, or even one month a year and still reap the benefits of their high-quality funds. For instance, I have 3 TRP funds and one month the AAB purchases for Fund 1, the next month it purchases Fund 2, 3rd month Fund 3, 4th month Fund 1 again. IMO, this is a great way to begin investing since you can manage your asset allocations easily (e.g. 33% stocks 33% bonds 33% cash would be easy to do since you’d just do 1 month for each and then repeat). I’m not affiliated with TRP in any way, and would love the ability to purchase an all-Vanguard portfolio, but until that day comes, I’m happy with AAB. I was in ICENX in my 401(k) for awhile but eventually dumped it because I didn’t like the expense ratio. Otherwise, it’s funny you should mention this because I’m a big T.Rowe Price fan. I’m doing my Roth IRA (TRRDX) with them on the systematic investment plan, and I plan to open up a regular brokerage account with them later this month in New Era. Savvy Steward: As far as I know, there’s no annual account maintenance fee for regular account. The fee is only for IRA account or 519/ESA account. And I checked my account history, I was never charged with the fees. So it’s quite a good product in my opinion. MM: Since when you owned DVN? The stock has really performed very well since 2002 (hope you got it at that time :)). I have Progress Energy (PGN), but I only started since late last year through DRIP program. I am going for the dividend. James: Thanks for answering the question for me. I also like a lot the flexibility TRP offers which makes it much easier to do business with them than with Vanguard. Vanguard is a good company with lots of great funds, but the bar is a little bit high. Not just the high initial requirement, they charge account maintenance fee as well. I just couldn’t understand why require such a high limit. T Rowe Price is truly where it’s at. I work for Wells Fargo bank with an investment branch and for the do it yourself kind of people, T Rowe is second to none. AAB is so key and allows to buy shares high and low over 10, 20 or 30 years. This is going to give any investor right around the avg return since inception on almost all funds. My only complaint would be that the online setup be updated. So dark in the background and could definitely be improved. Even making the #’s bigger would be great. Otherwise T rowe is my recommendation to all do it yourself kind of people.